Marianske Lanze, Czech Republic – I have mixed feelings about today’s race. While it isn’t the result I had hoped for, it’s the best Europa Cup result I’ve had thus far this season. And I was riding well. I went into today with the thought of having fun. All the races this season have been so stressful with me having to do this and get that result, and in the midst of some disappointing results and tears, I’ve forgotten the reason why I started racing in the first place: because I love it. And why do I love it? Because it’s fun. When I forget about the fun and just focus on the goal, my body, mind and spirit are never really relaxed and able to perform at its best. And frankly I’m tired of feeling so badly after races. I want to feel happy again. My first run had a bobble at the top of the course but then I got it together and had a solid run. Even Coach Mark said it was good and felt that it was enough to garner a second run. But when I got to the bottom, my time was not as fast as I had thought it would be. After all the riders went, I was in 36th overall but I didn’t know where I stood in my course (they take the top 16 of each course for a second run). I still felt pretty good because without that mistake I rode well. But I really wanted a second run. So I went to the top to wait it out. Eventually the unofficial list came out and I wasn’t on it. My head dropped. I was so sad because I was looking forward to a second run after a slew of one-run races. I tried to maintain my facial composure and fought back the urge for my eyes to well up. I gathered up my things and as I started riding away, I heard someone yelling my name so I stopped and hiked back up to the start. Turns out I wasn’t on the unofficial list because I was tied for 16th place in my course. I got a second run. Someone up there was throwing me a bone. The second run was good but a few gates from the finish I shot out too wide on a fall away gate and ended up in the powder. Ah! So close to the finish. But I finished with my best Europa Cup result this season and I rode well save a few mistakes. Coach Mark agreed and said I was carving more on the second run. So it was a little bittersweet but it’s good to know that I’m improving. And I had a little fun too. Marianske Lanze, Czech Republic – I’ve never been to any of the eastern European countries so I was looking forward to the race in the Czech Republic. I’ve always wanted to visit Prague since I hear it’s a wonderful city, and while we are about 150 kilometers from there, the town we’re in shares the same beauty that I imagine. I also haven’t been to a new country in a long time, particularly one where the language and history are so unique, so this is especially exciting. The town of Marianske Lanze seems very wealthy. There are several four- and five-star hotels housed in beautiful historic buildings, and there is even a casino that rivals the one I saw in Monte Carlo in terms of size and opulence. I haven’t yet explored the area, but the drive to the hill alone showcased the city’s magnificence. The ski hill is a small hill just a few minutes drive from the main street in town. The part of the hill where the race will be held has a decent steepness, but is very short, similar to the Steamboat Springs race hill. The snow is also decent; there are some icy parts but still very grippy so that shouldn’t be a problem. What might cause a problem is the 30 cm of snow they’re expecting tonight. I’ve never thought of myself as a slalom rider. I’ve always liked giant slalom better maybe because of the buildup of speed and the smoothness of carving turns. Slalom is very fast paced with short, not-so-clean turns, and while I have quick feet, I’ve felt that my tendency to go too straight makes slalom a constant battle at each turn where I’m just barely hanging on. But my results tend to be better in slalom, probably because I don’t have to be as technically perfect and being aggressive has more of an impact. 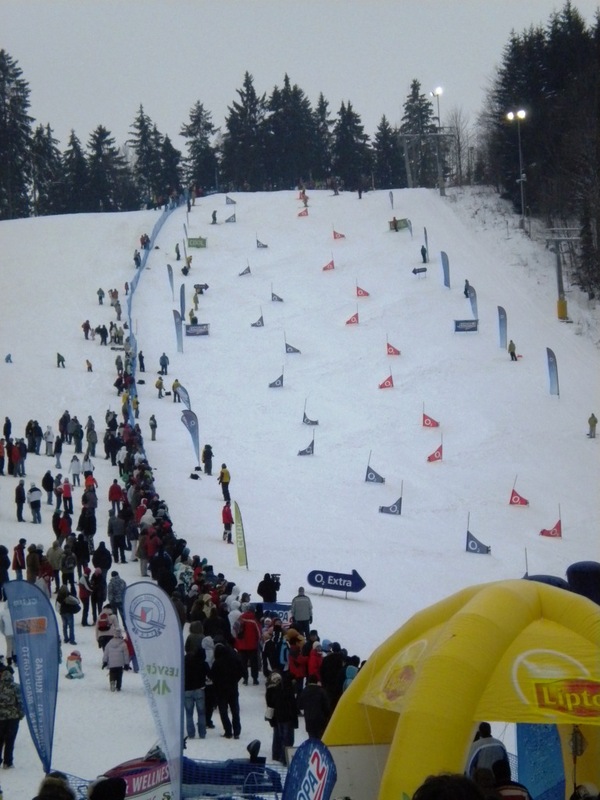 I can still remember some great slalom race runs from the past. And after today’s training session, I think it’s now more fun than giant slalom. My first run felt surprisingly good and I managed to stay in the course. My first run in slalom after being on my GS board for so long (last time I was on slalom was in early December at a race) is usually sketchy with me going way too straight and not able to finish the course, but this run felt really good. I focused on coming under the stubbies and that helped me to stay round, start the pressure early, and most importantly, release the pressure at the stubby. I also stayed forward and didn’t get in the backseat too much. I was so happy after that first run, my confidence blossomed. The rest of my runs felt even better, although I did get going too straight at one gate and DQ’ed, but that’s okay. I stayed with the focus of “Stay forward, under the stubby” and it worked really well. By the end of the day I was getting into a really good rhythm in the course (“blup, blup, blup”) and it was so fun since I didn’t have to fight the whole time just to make the turns. I flowed really well, and it was easy to ride. Coach Mark said that it was good riding although on some of the heelside fall-away gates I was getting a little far out of line. He seemed happy with it and I was ecstatic. Yay! I love slalom! While the next two days of races are not Olympic qualifiers, they are good opportunities to get the points I need to satisfy one of the Olympic criteria. My confidence is high, I’m really excited, and I’m looking forward to riding my best tomorrow. Kreischberg, Austria – Life is not going well. I know that is very silly and selfish to say especially since I’ve been blessed with wonderful family and friends, great health and an opportunity to follow my passion, but when your entire being is dedicated towards one goal and that goal seems to be slipping away, it’s hard to keep things in perspective. Because in reality, my life really is great. But my mind and heart do not always live in reality. The third Olympic qualifying World Cup was a disappointment. After the last training session, I went into the race with more confidence than I’ve had before and I knew, just knew, that today would be the day when I would get my top 30 and finish the day ecstatically happy. I envisioned it. I felt it. I believed it. I didn’t stress about it because I knew it would happen. According to Coach Mark the top of the run was good. Despite a few bobbles, I was carving more and had a decent line. I felt relaxed but still went for it. Things felt easy and smooth. I made it down the first pitch without problem or hesitation, just trusted that the board would hold and it did. But on the very last pitch, I went too straight at the third to the last gate, jammed on my heelside and washed out, dumping all my speed and losing time. I didn’t come to a complete stop and was able to get moving again into the finish, but I might as well have as I ended up 24th in my course and 47th overall. Who knows what would have happened if I didn’t slide out. I keep running it over and over in my mind, trying to figure out how much time I lost. Where would I have ended up had I not made the mistake? I immediately started beating myself up with doubts and wondering if I really did have what it takes, is my best really good enough, is this all for naught. But no matter how down I get, I can’t shake the feeling deep down that I am good enough and my Olympic dream is going to happen. There is a battle inside me between putting myself down and cutting myself some slack. I feel terrible after not doing well at a World Cup, but at the same time I am competing against the best girls in the world. Some have been doing it since they were kids, others have tremendous financial backing that allows them to be on snow year-round with an army of support staff, and most have both. I know I’ve come a long way with my snowboarding career and have already accomplished what would have seemed impossible ten years ago. So after more tears (ugh) and a great talk with Coach Mark, who remains concretely and steadfastly confident and supportive, I’m chalking today up to a mistake. Today’s result is not fatal, and it’s a learning experience. This journey is about the ups and downs, but more importantly now, it’s about the fight. It’s about getting up when you are beat down and fighting the good fight all the way to the end. I’ve always thought that the true test of character is how you react when times are challenging, so the big question for me is: Am I going to fight harder or just give up? I’m going to fight, with everything I have left in me. Kreischberg, Austria – Rolling into Kreischberg, Austria, venue for the next Olympic World Cup qualifier, was bittersweet. While it brought back great memories of the Snowboard World Championships in 2003, it was besieged by thoughts of the last time I was there four years ago when I did not qualify for the 2006 Games. But whatever, the snow was awesome and I couldn’t hold back a smile. After yesterday’s debacle, I desperately wanted a great day of training since it would be my last before the World Cup on the sixth. I wanted to get good feelings back and the much needed confidence that it would take for me to ride my best. Thankfully conditions were perfect: sun was shining, snow was hard and grippy, temps were very cold (which made my boots stiffer and thus more responsive and trustworthy). I couldn’t have asked for a better day. I was able to freeride the racehill once before they closed it, and it’s quite terrain-y. The slope rolls a lot and there’s a big hump in the middle of the course making for quite a steep drop for a few gates. But the more challenging the terrain, including steeps, the better. I’m not the most technically perfect rider out there, so anything that allows me to make up for that with aggression is a plus. I also enjoy that freefall feeling like I’m flying (see past post Addicted to the Drop) so that’s an added bonus. I just have to remember to stay forward, forward, forward coming over that pitch. The training slope wasn’t quite as challenging but boy was it fun! I still approached each run with the same warm up and aggression as I would a race run. I wanted to keep the intensity high, and my technical focus was to be patient before flipping the board over so I could give myself room to carve. (Performance statement = Stay aggressive, carve.) When visualizing, my thought would be “float/hold – edge – pressure”, with the ‘float’ meaning staying on the old edge without putting any weight down on the board and holding it there patiently until the fall line above the stubby, the ‘edge’ meaning rolling the board slowly up on its edge, and the ‘pressure’ meaning BAM! – on and off quickly within the arc around the stubby by pushing against the board. I also kept in mind to use the backfoot more (or weighting down the tail of the board more) particularly on the heelside by driving my outside hand down towards the back boot. Another racer told me yesterday to think of lifting the nose of the board at the end of the turn since speed is generated by pushing the board through the turn (with the back foot) and it’ll also keep the board from washing out since there is pressure on the edge. After watching some World Cup footage, I did notice that when the men ride they pressure the tail of the board and the nose lifts off the snow slightly. My runs felt great! I felt I was carrying speed and not scrubbing my turns, and putting pressure on the backfoot, especially on the heelside turns, felt stable and allowed me to shoot myself into the other turn. I didn’t wash out once. Even Coach Mark said I was carving more and that throughout my runs I was getting better at moving forward and keeping my body up with the board. I was so elated coming up the lift after training that I actually thought, “I love training!” It was a good technical day, but more importantly, my confidence is high going into the next race. P.S. I am aware that I must seem neurotic with the constant “I love snowboarding… I hate snowboarding… I love snowboarding…” flipping. But it truly is how I feel. Saalbach/Hinterglemm, Austria – Today was an awful day. Fortunately I’m writing this way after the fact and I’ve already let today’s training day go so I can be objective about it and not too emotional with the “snowboarding hates me” mantra I had going up the gondola. The snow conditions were very inconsistent making for probably one of the most challenging courses I’ve had in a while. Actually I think it is the most challenging course I’ve ever had since I didn’t finish a single run today. I’d either DQ on the delay or hit a huge hole and blow out of the course. I felt like I had no control and the board was just getting away from me. I felt that my mental attitude was good and aggressive, but my body wasn’t following suit. My front leg was pretty sore from getting through the bumps from yesterday and I think overall I was tired. Just a crappy day. But on my last run Coach Mark said that those six gates that I made it through before blowing out were the best ones I had for the day and that I was carving them more than in my other runs. (Unfortunately I had already punished my board after that last run.) So that was a plus. But I was soooo angry throughout the day! It was like I couldn’t use that aggression on the course but instead it just came out after the run. It was definitely a test in controlling my temper. I haven’t seen that temper in a really long time. Hopefully next time I can use it for good instead of evil. Saalbach/Hinterglemm, Austria – Today’s training was challenging. We drove to a resort in Austria and had an afternoon session, and by the time we got there the several inches of new snow from last night was all cut up from the morning skiers making for difficult and sometimes painful freeriding. Underneath the fresh snow was a very hard and icy base, and getting launched off the mini-moguls and landing on that base was jarring to my ankles. But once I relaxed and got a little lower and let my legs absorb more of the bumps, it got a lot easier. The course was on the same surface but we were able to slip a lot of the excess snow off of the line, exposing the hard, icy base beneath, which is great for racing so long as you can keep your line. It was still pretty challenging though as waves would form within the line making for a bumpy course. I want to treat every training run as a race run so I did my ‘bull’ race prep to psych myself up. I took my centering breath and repeated my performance statement a few times (which changed each run depending on my focus but always starts with “stay aggressive”), then slapped my legs and hands hard and got into the start. My first run felt energetic and alive, but I got late coming into a heelside turn and jammed too hard and fell. My second run was better. Coach Mark had told me that as soon as I get on my heelside I should release the pressure and that helped tremendously. Of course by the time I thought about it and did it I was at the stubby, which was where it should happen. I held a pretty good line and was able to shoot myself across to start my toeside. However I was getting too greedy on the toeside and starting my turn too early and as a result couldn’t fully commit to the turn. I made it down the course but on the last toeside gate into the finish I loaded up and it shot me too wide, narrowly missing the finish. Coach Mark said that the first four gates that he could see were good turns and I was carving. He said that type of riding is something we could build upon. My third run felt pretty good and actually easier than the second meaning I wasn’t fighting as hard, which possibly means I wasn’t sliding as much. The top wasn’t as good as the second run but the bottom felt better and I made the entire course. My last run was pretty out of control. I was getting late at the gates and was surprised I made them without crashing, and when I got down I felt the least tired of all my runs. So it may have been my fastest run. Coach Mark even said the top was good. We only did a few runs to keep the quality and intensity high. The long stretches to and from the course were tiring on my legs so it was a good amount of training. After I found myself mentally and emotionally exhausted due to maintaining the ‘aggressivity’ (Coach Mark’s term) of each run (and probably also from scaring myself a few times), but it felt like I was able to really keep my focus and attitude throughout training. It also helped that when I would come out of the start Coach Mark would yell at me as I was heading to the first gate. I think that helps me to remember to stay aggressive throughout the course. Overall a good day. December 30, 2009: The Switch Unflipped! Bischofweisen, Germany – Today’s night race was the last race of the 2009 calendar year. Thank goodness. Sadly 2009 wasn’t the best year for me snowboarding-wise, racked with less than stellar race results, lots of heartache and injury. But I’m looking forward to the new year with hopes of a fresh start and a brighter outcome. The parallel giant slalom course was sketchy. It was surprisingly straight, probably the straightest course I’ve ever raced on, which is good for me since turny courses pose more of a challenge. The snow was sparse with dirt and grass exposed in some parts of the course, with soft snow built up outside of the line. If you were to lose your line and get too round you’d end up in the snow bank with the possibility of going tail over head or coming to a complete stop. Either way you’d lose the race. I was pretty psyched to race. I’ve been reading the book “Ten Minute Toughness” and employing the advised mental techniques. While I can’t expect them to work immediately, it’s another good base to build upon. I wasn’t even worried about the snow conditions. As far as I was concerned since the course was so straight, I just had to stick to the line and I’d be fine. I just wanted to be aggressive right from the get-go and attack the course and forget about everything else. I had taken some freeruns in the morning to try to get the feeling back and find my lost toeside, and riding felt good again. Not great like in Colorado, but snow conditions and possibly jet lag would have something to do with that. (I slept amazing last night so that helped a ton.) Coach Mark even said at the end of the freeride session that I found my toeside. So yay! Nothing to worry about since my riding was back. I did my usual ‘bull’ prep in the start, complete with slapping my legs as hard as I could to make sure they were awake and angry, and got after it as soon as I passed the first gate. I moved my legs through each turn as quickly as possible, and found the carve on my toeside. I felt the urgency of racing at each gate and the need go-go-go. I could feel myself pull away from the girl I was racing and was like, “Yeah! This is what it’s all about!” On one of the toesides my hand caught the panel which pulled my trailing arm back, and for that split second when I was off balance with my body completely upright and in a very precarious position, time froze as I looked at the next gate and thought, “I have two choices: I can either let it get the best of me and crash like I did in the Copper race, or I can fight through it and try to hold on.” When I made the decision to fight, time resumed and I drove that outside hand down hard as I switched to my heelside edge and held the turn. Very weird, but cool. It was all going great until something happened. I don’t know if that near crash distracted me but I stopped being as aggressive as I was at the start. It was like the switch turned off, mid-course. Suddenly I was conscious of the ruts and snow conditions and I stiffened up, as my drive went into autopilot and I was just cruising. At one gate I even though, “I’m going into it too fast.” I mean of course I have to go into it fast, that’s what racing is all about! And I felt myself losing speed as the other girl was catching up. It was so strange. I finished the run but about a second out of making the second run. Sigh. So frustrating. I’ve finally got the start down by attacking immediately, but I couldn’t maintain the aggressiveness throughout the course. Coach Mark said the beginning was good with my legs moving well but I started sliding my turns the bottom of the course where I should have been carving, and that cost me time. Ahhhh! Why can’t I just put one great run together instead of just having great parts?! I could get upset, and part of me wanted to just give up. But I’m not going to do that. Not until the very last freakin’ race that determines if I can go to the Olympics or not. I’m going to fight tooth and nail despite what anyone thinks to get this done. I’ve put too much of myself into this to have it just taken away from me easily. Today’s race wasn’t an Olympic qualifier but it was a chance to get the points I need. Guess I’ll just have to do it all at once. Three World Cup and three Europa Cups left to do this in. It’s coming down to the wire but that just makes it more exciting and suspenseful. After all, if it was easy to do, wouldn’t everyone be doing it?